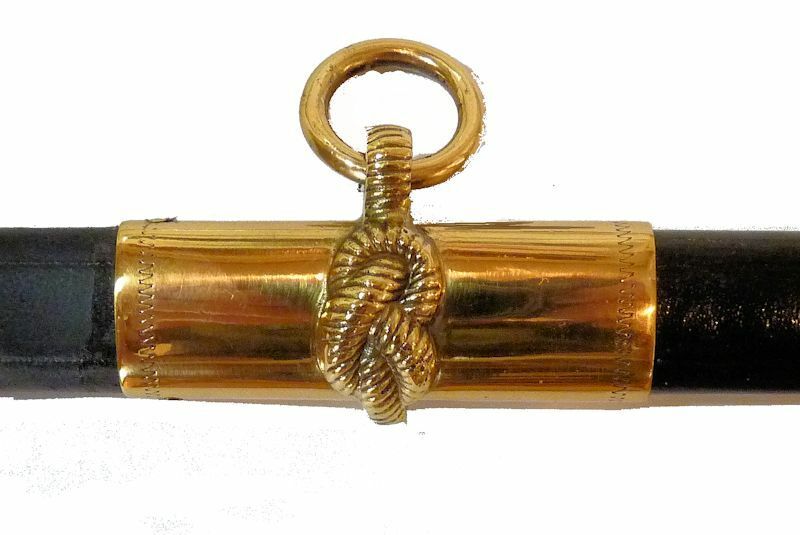 Vintage M 1852 Naval Officers Sword Presentation Quality! 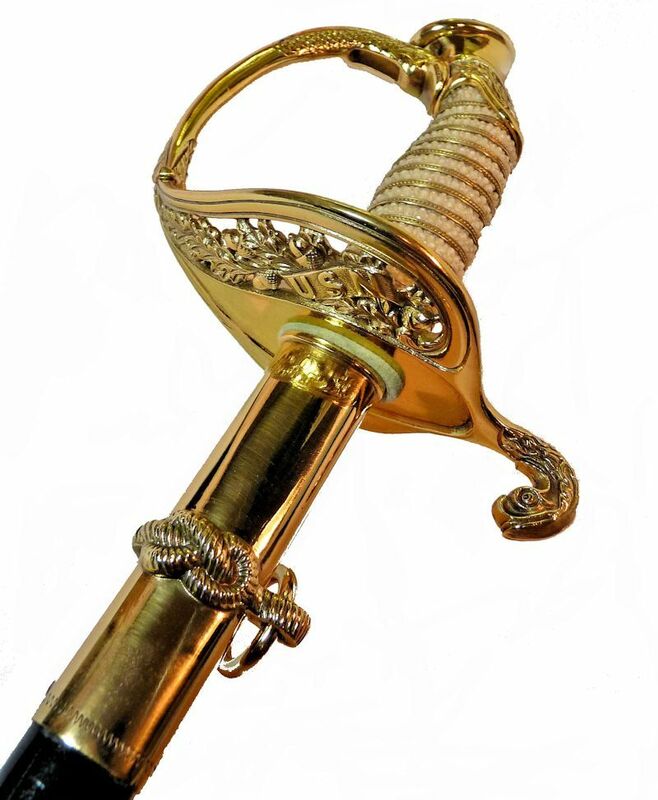 To view our current inventory of antique and vintage Naval swords and weapons, click here! Length Overall 35 1/4” long Blade 30” long by 5/8” wide 1/4" Thick LOA 36" Fuller 16 1/2” x 1/2“ Sword and scabbard weigh 2 lbs. 1 3/4 oz. 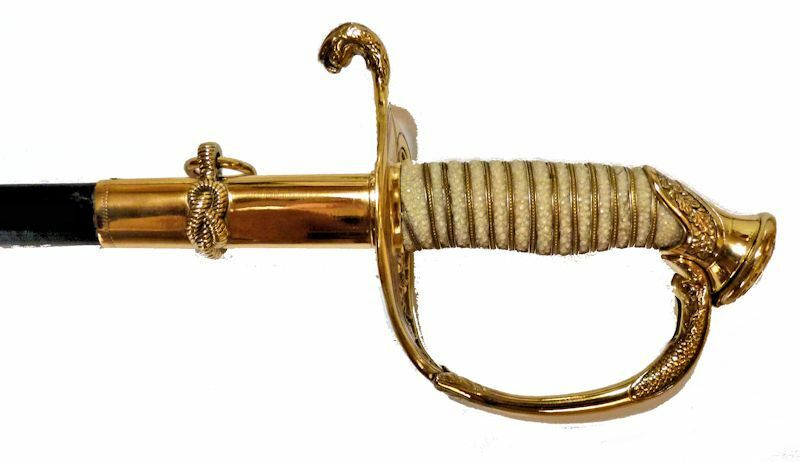 Presented is an vintage M1852 unnamed naval officer's sword that is one of the most beautiful edged weapons we've ever seen and, worthy of our restoration efforts which included renewing the gold gilt wash on all the brass work. The perfect blade sparkles with its brilliance having no imperfections to its deeply etched and frosted design. The spine is even detailed with floral leafs two thirds its length, and the two square knot hangers are carefully chiseled castings, both further evidence of high quality. 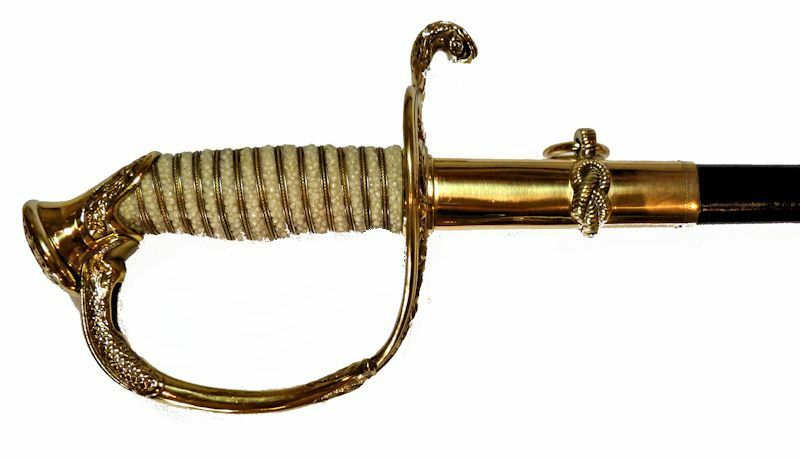 When acquired, the guard, pommel and scabbard bands had varying amounts of their original gold wash remaining which was not in keeping with the perfect blade. Our shop used a special process to renew the gold wash. The white pebbled grip has the look and feel of Shagreen, but is made of high quality plastic that has realistic look of Shagreen. The 13 turn, ornate wire wrap gives the appearance of three strands. The scabbard is also made of high grade plastic, but it has the feel of real leather. There is one small wear mark on the reverse where the sword belt hardware rubs that supports this conclusion. Never before have we encountered a sword made before 1930 that used synthetic materials which were hardly ever seen back then. In our opinion, its beauty and dazzling features should overcome any objection. Plus the fact, that only an experienced person will ever notice them. MARKINGS: The reverse ricasso is marked with N.S. Meyer Inc. New York with their DEFENDER Trade Mark above. This trade mark was not registered until 1935 which is ten years after we believe this sword was made. On the obverse is the six pointed Star of Damascus which should not be confused with the Star of David. 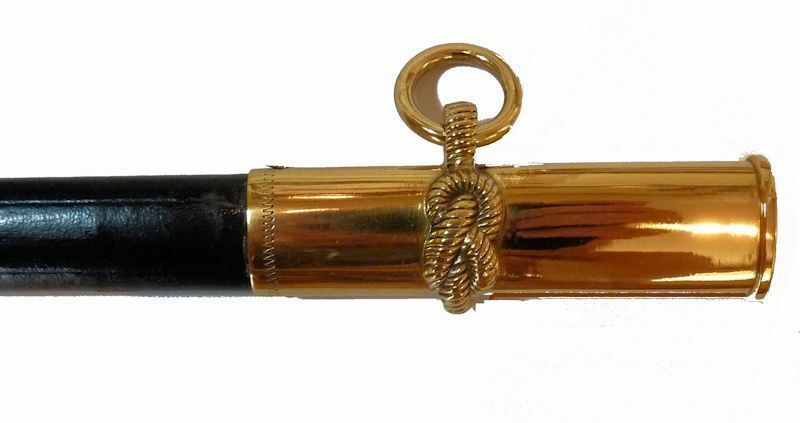 It has the military required brass slug in the center with a fleur dis lis over which is "Proved". 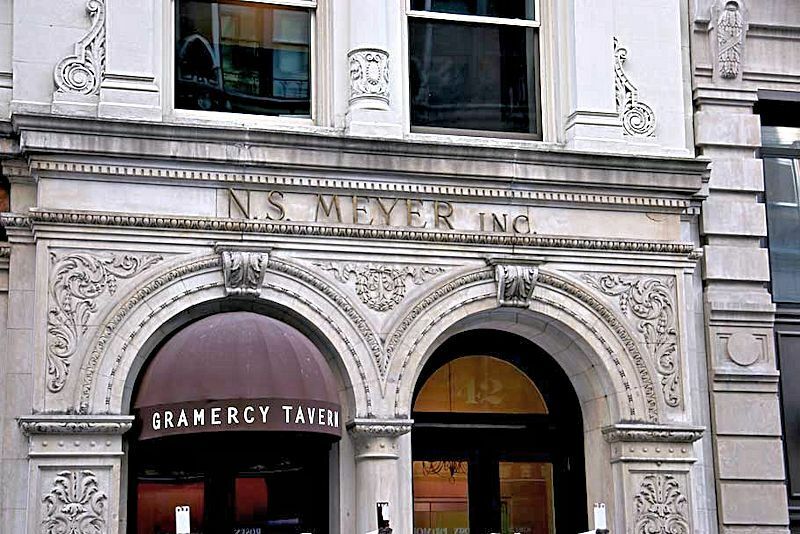 Meyer's was a longtime military dealer whose operations in Washington D.C. date back to 1868. The New York City operation was founded in 1906 by the founder's son, Nathan and was described in its early advertising as a dealer in Army and Navy equipment. Meyer like most merchants selling edged weapons didn't make them. They are cutlers bought their blades from various sources, having them marked with their brand names, and then fitted the hardware in various grades. Meyer was in business there from 1906 to 2000 when Vanguard Industries acquired the business after the Meyer's bankruptcy. During the 1920s, they were located at 103 5th Ave and in their last thirty years they were in the building pictured above on E. 20th St. DATING THE SWORD: This sword was made prior to 1930 because Section 304 of the Tariff Act of 1930 as amended (19 U.S.C. § 1304) requires most items, to bear labels informing the ultimate purchaser of their country of origin. No such mark is on this sword. That begs to ask why the company waited until 1935 to register the Defender trade mark. That might be sheer oversight which can easily be explained because a trade mark is also perfected by its 1st date of and continuing use. It is known that in regard to swords, that the country of origin markings on a European sword blade date back to after 1892 when when marking a blade's origin was mandated by law. Similarly, it is said that Meyer bought their blades for military swords from Carl Eickhorn in Solingen, Germany. In 1939, due to the increase in hostilities, Meyer terminated their dealings with Eickhorn and began buying their blades from Lilley-Ames. OUR CONCLUSION is sword was clearly made before 1930 and and after 1892 so that it must be American made, and in our professional opinion, is the work of Ames or Lilley-Ames after 1920. The left facing eagle on the pommel cap supports this conclusion. The dolphin or sea serpent ornament on the drag is mounted with its head on the side away from the hangers per the official design while the eagle on the pommel faces left surrounded by 13 stars. Thirteen stars is what was called for by the official 1852 blade design.